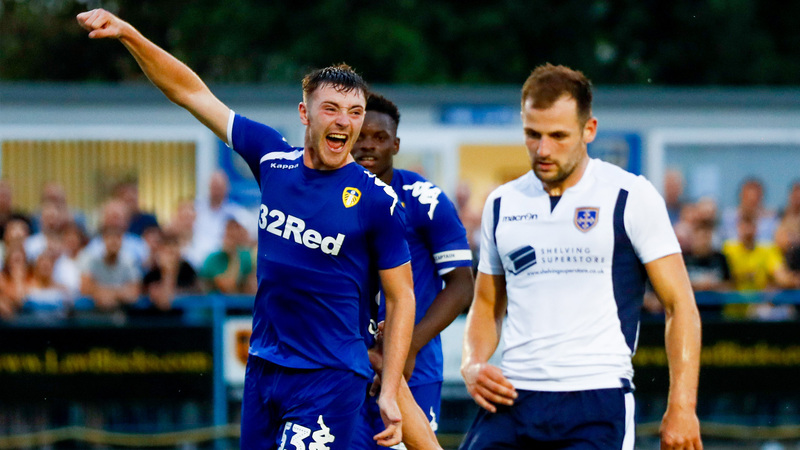 Edmondson brace helps Leeds beat Guiseley. Guiseley: Green, Moyo (Hatfield 38), Purver, Heaton (Trialist B 77) Thornton, Kennedy (Morrison 45), James, Liburd (Trialist A 61), Clayton (Odejayi 73), Thompson (Smith 61), Halls. Subs: Worsnop, Smith, Harvery, Flowers, Trialist C, Trialist D, Paley. Leeds: Blackman, Shackleton, De Bock, Diaz (Rey 68), Pearce, Klich, Vieira, Clarke, Baker, Roberts (Stevens 38), Edmondson (Dalby 72). Subs: Miazek, Ideguchi. 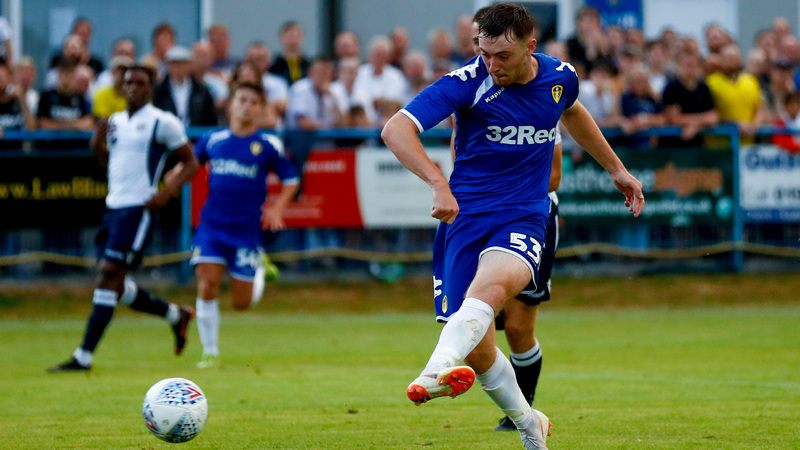 ﻿Leeds United’s penultimate game of pre-season ended in victory against National League North side Guiseley at Nethermoor. Guiseley had the first chance of the game inside the first minute, Andy Hall forced Jamal Blackman into action from the edge of the box. Two minutes later, the home side took the lead, Paul Clayton latched onto a long punt downfield from goalkeeper Joe Green and slotted home. Leeds came close to levelling soon after, Tom Pearce put a dangerous ball into the box which deflected just wide. Young striker Ryan Edmondson was then played through on goal, but Green rushed off his line and smothered the ball. Tyler Roberts was next to go close for Leeds, he found room in the Guiseley box before firing on goal, but his effort deflected just wide. The home side nearly doubled their lead in the 14th minute, Rowan Liburd showed great strength to get a shot away from the edge of the Leeds box and his effort rolled just inches wide. Halls then again tested Blackman, this time from a long range free-kick and only a fantastic save from the Leeds stopper could deny him. 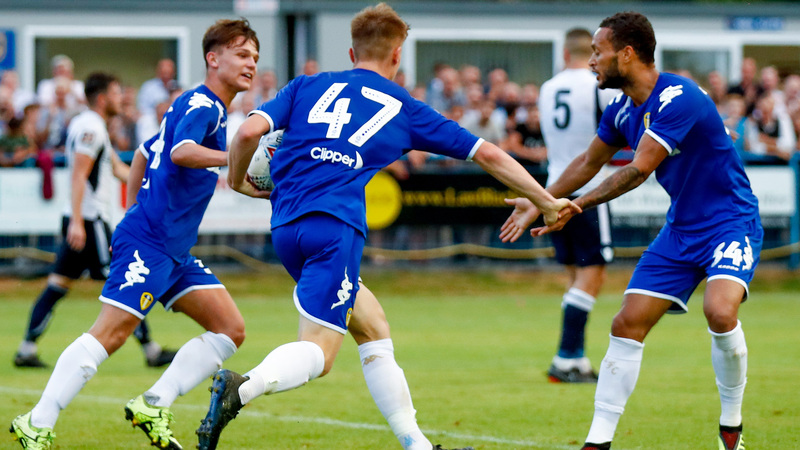 Lewis Baker showed great footwork to beat two Guiseley defenders, he then shot on the turn from the edge of the box, but his effort was just inches too high. Baker then won Leeds a free-kick 25 yards from goal and took the set-piece, but was unable to keep his effort down. Guiseley doubled their lead in the 29th minute, Reece Thompson met Cliff Moyo's ball into the box and showed great control, before finding the net. The home side nearly added a third soon after, Halls knocked a free-kick into the box from the halfway line, Liburd flicked it on and Will Thornton forced Blackman into a good save with a header. Baker nearly pulled a goal back for Leeds when he went through on the Guiseley goal, he tried to lift an effort over the out-coming Green, but his effort went over the bar. The Whites did get back into the game six minutes before the break, when Mateusz Klich fired into the bottom left corner from the edge of the box, giving Green no chance. ﻿The Whites levelled the scores early into the second half, Jamie Shackleton played Jack Clarke into the penalty area and he found the bottom left corner. Leeds continued to attack and took the lead in the 53rd minute, Klich played a low ball into the box and Edmondson converted with cool. Tom Pearce then drove an effort from the left side, forcing Green into action as the Whites ramped up the pressure. At the other end Thompson should have equalised for the home side, Will Hatfield put in a fine cross, but the forward could only fire over from close range. Vieira was next to try his luck from distance and his attempt wasn’t far away from finding the top right corner. Clarke then did well to break into the box and tee up Baker who was only denied by the best from Green, but from the resulting corner, Edmondson headed home Baker’s delivery, netting his second goal of the night. Leeds United’s two goal cushion lasted less than two minutes though, Curtis Morrison’s ball across goal was flicked goal-wards by Kayode Odejayi and Trialist A made sure by poking home. The Whites controlled the game in the closing stages, limiting Guiseley’s attacking threat, to come away with victory.